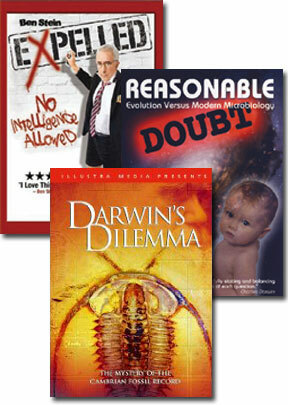 This set of three DVDs includes Expelled, Reasonable Doubt, and Darwin's Dilemma. Expelled -- Expelled: No Intelligence Allowed, starring journalist and actor Ben Stein, is an independent documentary film that explores the theory of Intelligent Design. Ben travels the world and learns the inspiring truth that educators and scientists are being ridiculed, denied tenure and even fired -- for the "crime" of merely believing that there might be evidence of design in nature, and that perhaps life is not just the result of accidental, random chance. Reasonable Doubt -- As scientific knowledge grows exponentially, Darwin's theory of evolution becomes more debatable and hotly contested by researchers on both sides of the growing scientific controversy. Reasonable Doubt presents a logical rendition of some of the fundamental problems evolution theory faces in the light of modern scientific knowledge with easy-to-understand explanation, animations, interviews and logical illustrations. This thought-compelling and no-punches-pulled DVD illustrates dissenting scientific issues in the fields of microbiology, physics, cosmology, and statistical probability. This is not a Creation or Intelligent Design presentation and it does not argue for any particular alternative theory to evolution -- just the cold, hard facts regarding the scientific shortcomings of evolution -- but some different theory is clearly called for in light of modern science as illustrated in Reasonable Doubt: Evolution Versus Modern Microbiology. Recommended for ages 14 and up. Darwin's Dilemma -- This powerful, new documentary explores one of the great mysteries in the history of life: the geologically-sudden appearance of dozens of major complex animal types in the fossil record without any trace of the gradual transitional steps Charles Darwin had envisioned 150 years ago. Frequently described as “the Cambrian Explosion,” the development of these new animal types required a massive increase in genetic information. Growing evidence suggests that the creation of novel genetic information requires intelligence, and thus the burst of genetic information during the Cambrian Explosion provides convincing evidence that animal life is the product of intelligent design rather than a blind undirected process like natural selection. Darwin’s Dilemma recreates the prehistoric world of the Cambrian era with state-of-the-art computer animation, and the film features interviews with numerous scientists, including leading evolutionary paleontologists Simon Conway Morris of Cambridge University and James Valentine of the University of California at Berkeley, marine biologist Paul Chien of the University of San Francisco, and evolutionary biologist Richard Sternberg, a Research Collaborator at the National Museum of Natural History.